Avalanches are a significant mountain hazard—responsible for more deaths each year in the United States than earthquakes. Once in motion, snow slides are a powerful force of nature, capable of snapping off mature trees like match sticks, and easily destroying buildings. And when an avalanche finally stops, the snow sets up like concrete, making rescue efforts extremely difficult, and chances for survival slim. 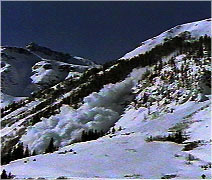 An avalanche, or slide, is simply a mass of snow moving down a slope. 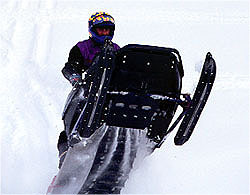 There are two basic elements to a slide; a steep, snow-covered slope and a trigger. But despite this apparent simplicity, avalanches can be surprisingly hard to predict. Changing weather conditions continually affect the strength of the layers within the snowpack, and the snowpack on every slope is different depending on what exposure that slope has to the wind and sun. In fact, layers within the snowpack are the first thing that avalanche forecasters look at to try to predict the stability of a slope and its potential to slide. Different storms create distinct types and amounts of snow. Once the snow settles onto the existing snowpack, it can quickly metamorphose into distinct crystal types, which are determined both by changes in temperature and whether or not the snow is exposed to the sun. As the season progresses, the snowpack becomes a multi-layered history of storms and weather. But even a deeply buried layer can continue to change, as changes in temperature slowly move through the snowpack, and heavier snow weighs down on lower layers. A weak layer is created whenever snow crystals are shaped in a way that prevents them from bonding tightly together. How much of a threat an avalanche may pose depends largely on how deeply buried a weak layer is. When the snow near or on the surface doesn't have much cohesion—in other words, it's a weak layer—loose snow slides are common. The snow on the surface begins to slide from a single point, collecting more snow as it moves, and widening out into a triangular shape, creating what is commonly called a sluff. Sluffs are similar to sand rolling down a sand dune. Typically, these loose snow avalanches do not involve much snow and are not a major threat to people or property. But the threat of larger avalanches increases as a weak layer becomes more and more deeply buried, causing the entire snowpack above to become more unstable. When a weak layer is buried underneath a strong layer, slab avalanches are possible—if enough stress is added to the slope. 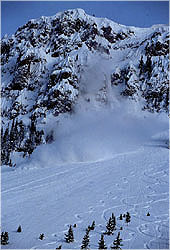 Stresses which might trigger a slab avalanche include new or wind-blown snow, a skier or snowmobiler, or an explosive used intentionally for avalanche control. 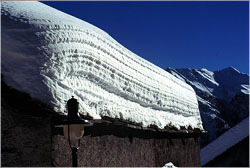 In a slab avalanche the snow breaks off in a single large plate, which then fractures and moves down the slope. 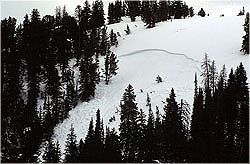 These avalanches tend to be much larger, involve more snow, and are more dangerous to both people and property than sluffs. When people trigger them they are often in the middle of the slab, which is what makes them so deadly; when the avalanche releases the victim is quickly engulfed in the snow, and the chances for escape are slim. To find out ways to avoid getting caught in an avalanche, check out Snow Sense. Photos: (1) WGBH Educational Foundation; (2), (5) Kate Churchill/WGBH; (3-4) David Ruddick.